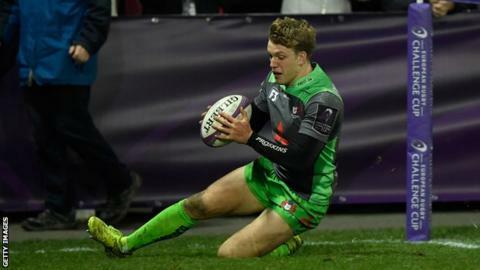 Gloucester ran in 11 tries to thrash Zebre and make it three wins from four games in Pool 3 of the Challenge Cup. The hosts made made nine changes but were 45-0 up at the break, with David Halaifonua crossing either side of Ciaran Gaffney's yellow card. Ollie Thorley ran in four tries to add to scores from Freddie Clarke, Will Safe, Cameron Orr and Motu Matu'u. Matteo Pratichetti and Valerio Bernabo scored consolations for Zebre, who also had Tommaso D'Apice sin-binned. Gloucester stay second, three points behind leaders Section Paloise, while defeat means bottom side Zebre have now lost all four of their group matches. Gloucester: Sharples; Thorley, Twelvetrees, Atkinson, Halaifonua; Burns, Vellacott; Orr, Matu'u, Hohneck; Slater (capt), Galarza; Polledri, Safe, Clarke. Replacements: Hibbard, McAllister, Denman, Savage, Beckett, Heinz, Williams, Purdy. Zebre: Gaffney; Pratichetti, Bisegni, Afamasaga, Venditti; Bordoli, Palazzani; Ah-Nau, Luus, Tenga, Krumov, Biagi (capt), Sarto, Minnie, Mbanda. Replacements: D'Apice, De Marchi, Chistolini, Bernabo, Panico, Raffaele, Azzolini, Minozzi.